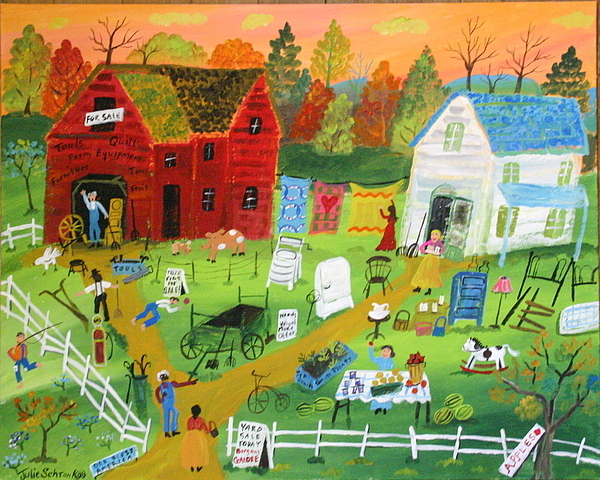 Big Yard Sale is a painting by Julie Schronk which was uploaded on January 15th, 2010. These folk art folks are having a giant yard sale and selling everything, including the kitchen sink! This new folk art paining is filled with details and great fall colors and will look great framed. Notice the old refrigerator for sale, tools, a bed frame, quilts and an old ringer washer to name a few. It's a 16 X 20 on flat canvas board. It's a good example of the kind of traditional folk art I regularly paint, and this one is out of my personal collection! There are no comments for Big Yard Sale. Click here to post the first comment.